Based on the 1973 novel, The House With a Clock In Its Walls is about a young boy named Lewis (Owen Vaccaro), who is sent to live with his long-lost, eccentric uncle Jonathan (Jack Black) after his parents die in a car crash. As he adjusts to his new life, Lewis starts noticing supernatural events within Jonathan’s old, creaky house, including a strange ticking sound coming from the walls. Jonathan reveals that he, and his best friend and neighbor Florence (Cate Blanchett), are practitioners of magic. Despite some reservations, Lewis convinces Jonathan to train him to be a warlock, and he shows natural talent. 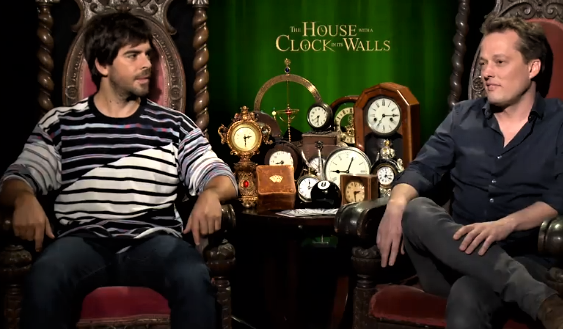 But Lewis’ struggle with his own confidence and overcoming the trauma of his parents’ death ultimately lead him straight into the mystery of the hidden clock in the walls of the old house and on the path to confront the evil warlock who put it there. The film harkens back to movies of the 1980s, such as Time Bandits and Gremlins, as a unique blend of family entertainment and horror genres. Director Eli Roth, known for ultra-violent horror films like Hostel and The Green Inferno, takes on the film as a beginner’s course to the world of horror, but the scares do not overpower the film. The story gives great opportunity for coming-of-age moments, and the young star, Vaccaro, gives an admirable performance. Black and Blanchett give magnetic performances and their offbeat chemistry is unexpected and wholly welcome. In a world with countless movies adapted from magical young adult novels, The House with a Clock in Its Walls still manages to be something utterly unique and have much more depth than the typical post-Harry Potter fare. Recently, I was able to go on the Universal Studios lot to get a behind-the-scenes look at the props and special effects of the film, as well as interview director Eli Roth, composer Nathan Barr, and Owen Vaccaro (Lewis). It was a magical evening to say the least, being able to be among the people who made this fantastical film possible while also gaining more insight on how it was all put together. The props were very detailed and just as creepy in person as you would suspect! The automatons we learned were from various places including antique shops, some made from scratch for the film, and some even from Steven Spielberg’s personal collection of automatons! The character Chair from the film (who is basically a dog in chair form) was part animatronic and part operated like a puppet by people on set. The House With a Clock In Its Walls is now available on digital and Blu-ray!